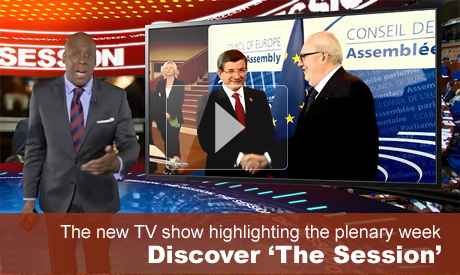 The Presidents of Austria, Heinz Fischer, and of the European Commission, Jean-Claude Juncker, and the Prime Ministers of Georgia, Giorgi Kvirikashvili, and Turkey, Ahmet Davutoglu, were among leading personalities who addressed the Parliamentary Assembly of the Council of Europe during its Spring session. The refugee and migrant crisis in Europe was on the agenda, with debates on a stronger European response to the Syrian refugee crisis, the human rights of refugees and migrants in the Western Balkans and the new challenge posed by forced migration. Other items on the agenda included debates on assessing the impact of measures to improve women's political representation, preventing the radicalisation of children, humanitarian concerns with regard to people captured during the war in Ukraine, the handling of international public health emergencies, and the fight against antisemitism in Europe. There were also several requests for urgent and current affairs debates. The Minister for Foreign Affairs of Bulgaria, Daniel Mitov, addressed the Assembly in his capacity as Chairman of the Committee of Ministers, and the Council of Europe Commissioner for Human Rights, Nils Muižnieks, presented his annual activity report 2015. The Secretary General of the Council of Europe, Thorbjørn Jagland, answered questions from parliamentarians. The Assembly also evaluated the partnership for democracy in respect of the Palestinian National Council.